Another item for the Mixed Media challenge at Splitcoast…this time a card. Can you tell I’m excited about this new challenge? Since my inks were all still laying on my work table thought I’d put them to good use. One of the items that I’ve learned to use while taking the Clean and Simple 2 card class is the Fiskars Compact Stamp Press. This card is a great example of how to use it. I placed my stamps for this scene on my card stock, playing with the layout until it was how I wanted it to look. Then I simply pressed my stamp press down and instantly my scene was all set up and ready to stamp…no stamping one little bit of the scene at a time…it was all stamped at once. So once it was set up, I inked it with embossing ink and stamped the card stock. Then it was heat embossed with clear embossing powder. But, to my horror, the little bird, who was supposed to be sitting on a floral stem was hanging mid-air…yikes!!! Versamark pen to the rescue…just scribbled a little on to resemble part of plant, heat embossed with clear embossing powder and done! It sort of looks like it belongs right??? Help me out here people!!! Next I took a piece of Eclipse Masking Tape and angled it across my page and sponged one of the colors on. Then, just angling the mask from side to side, kept adding the different inks until done. Then, I stamped the background stamp in Picked Raspberry Distress Ink over top of the entire page and buffed the ink off the resist area with a paper towel. And, finally, a few colored rhinestones for a little bit of bling. This looks fantastic! I would never have known about your hanging bird by looking at your card…it looks perfect to me! Love your vibrant colors and design. Isn't that stamp press amazing? I didn't think I needed one until I had one…now I can't imagine not having it! This is a gorgeous card, Lee-Anne! 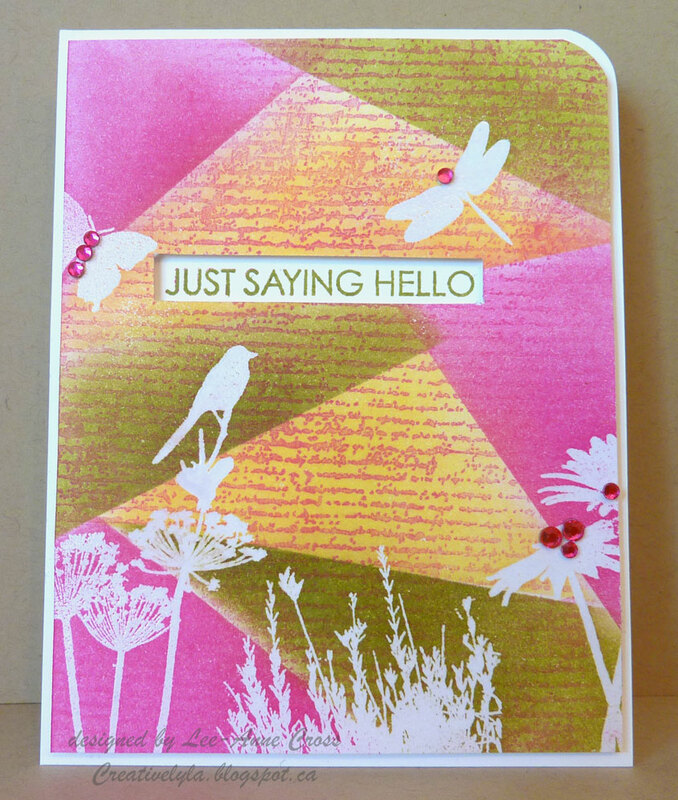 LOVE the white embossed images and wonderful colour blocking you used on the card, Lee-Anne Fabulous card! This is gorgeous and really stands out at SCS gallery!!! I had to come and read more!!! I NEVER would have guessed you added part of the plant so the bird wasn't hovering! AWESOME work! Fabulous color!